I have decided to build my own pedal board. I have got a general idea of the structure and layout. Does anyone know the name of those steel things that people put on the corners of wooden pedal boards to make them look more professional? Jansen is the probably the best place to get all the hardware for a pedalboard. They stock a good range of corner protectors and other useful stuff. Just bumping this thread, because I am thinking of making one too. Has anyone else on here made, pics? Unless you have too much free time I wouldn't go overboard building something. I would just find some kind of robust case that is the right size and cut a piece of ply to fit in. The case would probably just be for transport, ie you take the plywood board out when you play. Put two small handles on the board to make it easy to take in and out of the case. Maybe you can find a case where the top or bottom unclips but that's probably not necessary. Paint the plywood black (or purple) and get some velcro or those metal pedal clips (if you can't find them just use some bike chain links). Put some small rubber feet on the board so it doesn't slip around. Whatever you do, post some pics once you are done! I like the idea of the case Timi. simplifies it a lot. I was thinking how to go about doing a removable lid. i have a 19" 5U rack blanking plate that i use, velcro strips running across it. fits nicely into an old Samsonite small suitcase. compact and effective, been using it for years now. and i've got another big sucker that stays at home, made out of 1/2" MDF (painted black of course! ), with a scrap of industrial carpet glued to the top. i've got larger rubber feet on the back of it to angle it slightly when in use. 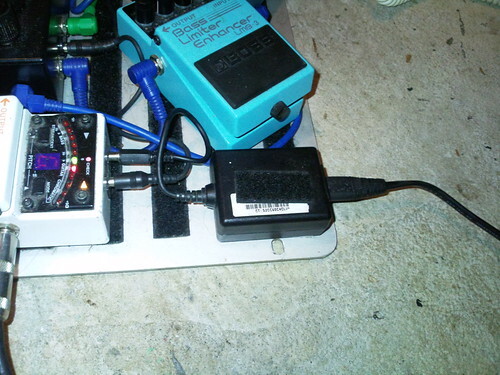 everything's powered by a 10v 1A laptop power supply...never any problems. i reckon most/all of those commercial pedalboards and power supplies are ridiculously overpriced and an absolute waste of $$. model.citizen wrote: everything's powered by a 10v 1A laptop power supply...never any problems. Yea pretty pricey alright...Does the lap top power supply put any hum in your signal at all? nah, lappy PSU's are regulated, so it's all good. currently got mine feeding 7 pedals, no problems. good thing with those PSUs is that they're (usually, esp. with ones for older laptops that didn't need 24v or stupid current) really small, fit on a pedalboard easily, and run with a figure-8 power cable. solid, no fuss. and amazing how much you can fit in with a bit of thought...almost like a clown car! Okay, so me and my son had a go at making one today. Got the case at super cheap auto for $27, good score. Well done boys simple,cheap,and "effective"
I like how model.citizen has the major pedal crammage on his board,you might even get one more on there somewhere nice to know about that lappy power supply too. Really? It looks fine to me. Bit messy underneath but that doesn't matter. 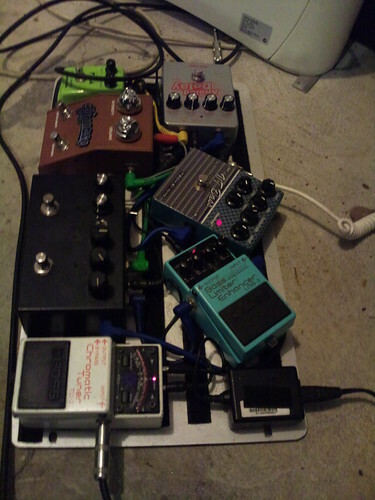 I don't know what those two other pedals are but I would suggest putting your tuner first in the chain.